The Bank has aggressively scaled up its footprint with the acquisition of ING Vysya Bank. 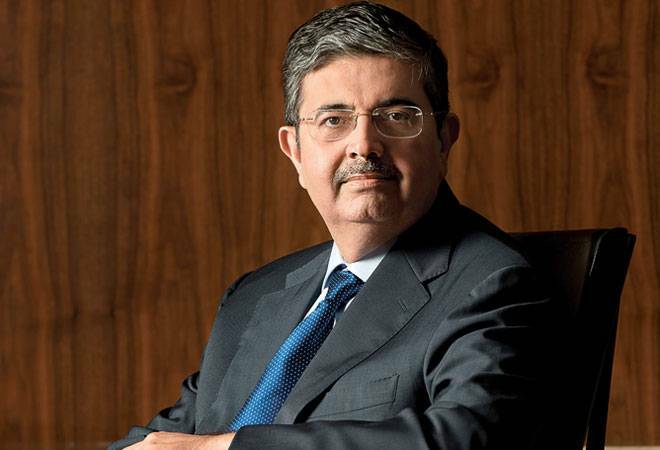 Uday Kotak, 56, believes that financial well-being is the foremost priority for most people along with staying healthy. He should know-Kotak has been managing the money of others for almost three decades now. "We want to experiment. We want to learn. We want to see how the world is moving, and move forward"
Kotak shunned his family's commodity trading business to start afresh as an entrepreneur at the age of 26 and has since built a financial services empire around Kotak Mahindra Bank. The bank is seen as one of the most efficient in India and its investors have been generously rewarded by the stock market - its market capitalisation stacks up to a whopping Rs 1,25,000 crore. Kotak is now aggressively looking to expand the footprint of his bank. He is fresh from his prize catch - the Bangalore-based ING Vysya Bank, snapped up by him for $2.4 billion in an all-stock deal (his own stake in the bank has fallen from around 40 per cent to 33.4 per cent). In a single stroke, Kotak Mahindra Bank's balance sheet size has pole vaulted from Rs 95,430 crore to Rs 1,06,012 crore - it is now India's fourth largest private bank after ICICI Bank, HDFC Bank and Axis bank. A couple of months ago, the bank had overtaken Axis Bank in terms of market cap. Armed with a universal banking model (akin to ICICI Bank), Kotak Mahindra Bank plans to cash in on its expanded branch network post merger to not only reach out to more customers, but also leverage it for a host of other activities. For instance, it will allow the bank to sell insurance products to mutual funds. No wonder then, Business Today's Best Banks jury members put their stamp of approval on Kotak Mahindra Bank as the Most Future-Ready Bank. But the real work for Kotak starts now as merging the numbers of two banks is far easier than integrating products, people, branches and technology. "We are right now going through the pangs of integration. I think the biggest challenge lies in IT and people integration," admits Kotak, Executive Vice Chairman and MD of the bank. The ING merger has contributed significantly to its SME, crop loan, foreign exchange and MNC client portfolio. Kotak has surgically hived off the bad loans of ING Vysya Bank to a separate assets division. He calls it a 'bad bank'. The stressed loan book of ING Vysya was about 6 per cent, while it is 2.5 per cent for the merged entity. Prior to the merger, Kotak Mahindra Bank's gross NPAs stood at 1.9 per cent of its loan book. "If regular corporate banking relationship managers get bogged down with handling stressed assets, their attention gets diverted from the regular business," says Kotak, whose group has expertise in handling bad loans through its asset reconstruction business. 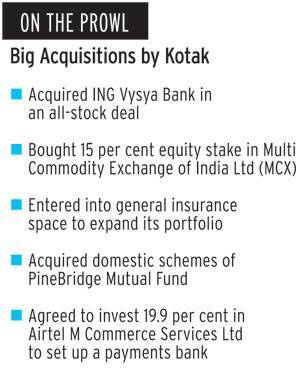 Kotak's merger with ING is seen as a bold move. It came at a time when the industry is facing deteriorating asset quality and capital challenges. The last big merger in the banking sector was that of HDFC Bank and Centurion Bank of Punjab in 2008. The Kotak-ING merger has impacted some key performance parameters like capital adequacy, net interest margin, net NPAs and also return on assets. Kotak looks at the glass as half full. "That's where the opportunities are...if everything was perfect where would be the opportunity," he asks. The analyst community, too, agrees. "Whenever you have a transaction of Kotak-ING size, the benefits are not encashable in year one. Such a merger tends to provide a very strong pain for some period of time," says Rajat Rajgarhia, MD (Institutional Business) at Motilal Oswal Securities Ltd. Earlier, in a report, the brokerage had cited key risks inherent in the merger including the overlapping of some branches and integration of workforce and the challenge of improving the productivity levels of ING branches. Kotak, though, saw the benefits from the merger. 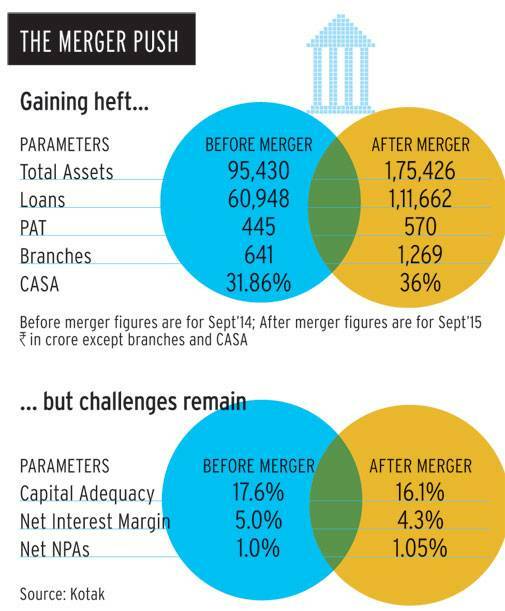 At the time of the merger, Kotak had 641 branches, while ING Vysya Bank had 573. There are 75 overlapping branches, which will be relocated soon. Kotak's focus is to get more throughput from the existing network after the core banking integration in the last quarter of this fiscal. Kotak would be absorbing most of the ING staff of 10,000 employees, taking the headcount of the bank to about 40,000. Kotak claims the bank has a very well-balanced book with 38 per cent branches in the South, another 30 per cent in the West and the rest in the North and the East. Over 50 per cent of the branches are in rural and semi-urban areas. "We will not rush to open too many ATMs," says Kotak. The bank is working on two engines - the traditional engine (branches) and digital engine. Clearly, both have to co-exist for quite a while. "We think, in the new emerging digital world, around 1,500 branches is good enough," says Kotak. ICICI Bank and HDFC Bank have over 4,000 branches, while SBI has 16,000-plus branches. Kotak has rolled out digital products such as 'kaypay', a payment product for sending money to Facebook friends including non customers, and Netc@rd, a single use virtual card for doing e-commerce transactions. The bank has also introduced Jifi current account and Jifi saver for depositors with social media linkages. Kotak claims that the bank is already getting 40 per cent of all its term deposits online. But the threat of disruption from NBFCs, technology companies, payments banks and small finance banks is for real. "You have to be ready for any disruption all the time. Never go to sleep," says Kotak. The bank has taken a 19.9 per cent stake in Sunil Mittal's Airtel M-Commerce. "We want to experiment. We want to learn. We want to see how the world is moving and move forward," says Kotak. Banks stay away from small ticket size transactions because those involve costs for a bank and they don't earn much. "We will learn from the payments bank model if they can make these smaller transactions profitable," he says. The man, who also has an investment banking unit, will surely be hunting for more acquisition opportunities in the payments and small size banks space. "I am of the view that some (new players) will succeed, while some will not. Out of these (21 players), there will be one or two who will really make a difference," he says, sounding a note of caution. "In India, so far, we have not seen any true bank failures. We have to be clear that as we open up, there will always be some more prudent players and some aggressive players. The system must be ready to take mortality." Kotak, often spotted taking evening walks at Mumbai's Marine Drive, is upbeat about the future of his bank. "If I look at India from a five-year view, it's a great time to build businesses here," he says. But, to succeed, banks not only have to be future ready, but also have to win the trust of their clientele for the long haul, he sums up.